Today I am pleased to introduce you to Annie Richards. I am a little embarrassed, because I was supposed to have this up a couple of weeks ago, but then packing and traveling took over my life and some things did not get done. However, I hope you will all join me in welcoming Annie to the blog today! Annie is the protagonist of Sarah Ashwood’s newest fantasy novel: Aerisian Refrain. 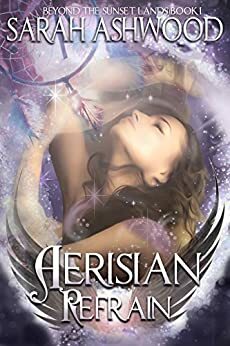 I’ve been wanting to read Sarah’s Aerisia books for a while now, and I definitely need to get my hands on this newest addition! So when InterFiction decided to send me into Aerisia to interview Annie Richards, I was very excited. As the light from my badge fades, I find myself standing in a large hallway. Over the top of a door to my left a horse pokes his nose inquisitively in my direction. I grin and go over to pat the soft nose, murmuring softly. Down the hall, another horse is standing in cross-ties and a dark-haired girl is brushing him with long, gentle strokes. Considering that nobody else seems to be around, and that my badge is fairly accurate, I assume this must be Annie Richards, the character I am here to interview. I walk over, clearing my throat so as not to startle her or the horse. She peers around the animal at me, her violet eyes striking in her deeply tanned face. “A few is right,” she sighs. “Most of the regular folks are very welcoming, but I seem to have stepped on the wrong side of Aerisia’s fairies right from the beginning, as well as most of the Simathe. The Simathe are a group of immortal warriors, and Hannah is married to their High-Chief. Which puts me in an awkward position. I don’t know why they don’t like me: I haven’t done anything wrong that I know of.